If you’re in the mood for sushi, but don’t want to fork the bill, here’s a price friendly at home sushi option! 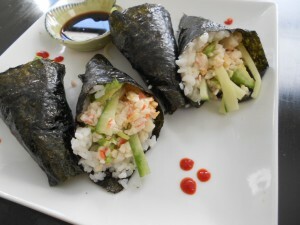 My husband and I love making these sushi hand rolls. They really cure a sushi craving and they’re the cutest appetizers for parties! Mix one package of imitation crab, mayo, sriracha, and sesame seeds. Spread a thin layer of crab mix on top of the rice. Top the crab with some cucumber slivers and avocado slices.